The French language came to North America with the first French settlers in the 17th century. French and British forces had long been at war before the final victory of Britain in the mid 18th century; after the loss of New France, France lost contact with its settlers and Quebec French became isolated from European French. The two languages evolved in different ways, leaving Quebec French with older forms of pronunciation and expressions that later died out in France. Until the emergence of radio and television broadcasting, French Canadian society had been completely dominated by English, which was the language of the ruling class. During the 1960s, Quebec went through a period of intense change called the Révolution tranquille (Quiet Revolution). This period marked the transition from political conservatism and sociocultural immobility, mainly orchestrated by the Roman Catholic Church, to a modern era characterized by major social development and an increase of Quebecois control over the province’s economy. The Quiet Revolution was also characterized by the affirmation of the Quebecois identity, closely related to their linguistic affirmation. The French language spoken in Quebec was no longer a simple linguistic matter, but became an ideological, political, academic, and economic issue — the symbol of a society willing to get rid of its alienated minority status. The modernization of Quebec society had repercussions on the language itself, which was seen by the francophone elite as underdeveloped and corrupted by its contact with English. Laws were voted to promote French as the only official language of the province of Quebec, and plans to replace pervasive English terminology were supported by the Office Québécois de la Langue Française. At the same time, an eager desire to standardize and to improve Quebec French in line with the Metropolitan French norm was observed. This drew criticism from a lot of Quebecois, who claimed that their language was an integral part of their identity. Today, even if the status of Quebec French still remains slightly ambiguous, the Quebecois have mainly lost their feeling of inferiority toward Metropolitan French. The media now uses what is called ‘standard Quebec French’, and people are proud of its deviations from European French. There are several types of differences between Metropolitan French (MF) and Quebec French (QF). Besides phonetic differences that will not be addressed here, the more obvious ones are lexical. Here is an overview of what they look like. There are plenty of words in QF that are falling out of use or sound old-fashioned in MF: for example, soulier (shoe) rather than chaussure in MF, bas (socks) instead of chaussette in MF. We can also observe some small discrepancies that can cause confusion, since word meanings are not always completely equivalent. For example, “birthday” is anniversaire in MF but more commonly fête in QF, while fête in MF (meaning “party”) is party in QF (pronounced as [paʀte]). Thus, the expression fête d’anniversaire (“birthday party”) is usually party de fête in QF. In QF foulard is the equivalent of both écharpe (scarf) and foulard (light scarf) in MF. Where MF requires a precise word for each relationship, the informal word chum in QF can encompass husband, common-law husband, and boyfriend. But differences between these two forms of French go beyond the lexical level. Although some Quebecois tend to deny it, there are also some syntactic differences. One can observe the use of prepositions in QF where MF would not allow them. For instance, in QF il vient à tous les soirs (he comes every night) is il vient tous les soirs in MF. Twenty years ago, the verb aider (to help) was still a transitive verb with an indirect object: aider à quelqu’un instead of aider quelqu’un. While the use of the interrogative pronoun in a declarative sentence such as je ne sais pas qu’est ce qu‘il faut faire is seen as an uneducated mistake in MF (where people say je ne sais pas ce qu’il faut faire), this form is commonly used in QF. Finally, more surprisingly, morphological differences can be noticed between the two languages. While trampoline is a feminine noun in QF, it is a masculine one in MF. 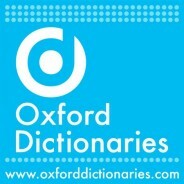 On the contrary, moustiquaire (mosquito net) is a feminine noun in MF and a masculine one in QF. Cash machine is translated as distributeur de billets in MF and distributrice de billets in QF. Some recent linguistic borrowings have different genders too: feta and mozzarella are feminine nouns in MF but masculine ones in QF; job is a masculine noun in MF and a feminine one in QF, and so forth. One can also observe some nouns with a floating gender in QF, for instance, sandwich is either feminine or masculine. About two thirds of Montreal’s population are francophones, most of whom are bilingual. However, in Quebec City and rural Quebec, even the youngest aren’t necessarily fluent in English. Some people do not have any knowledge of English whatsoever. Yet, since the province of Quebec is surrounded by English-speaking regions (i.e. the rest of Canada and the United States), even if people fiercely fight it, QF is inevitably and strongly influenced by the English language. Some Anglicisms are so commonly used that they have become assimilated into the particularities of QF: for example, tomber en amour literally means “to fall in love,” and prendre une marche is literally “to take a walk.” There are a lot of mispronounced English words that have been introduced to QF, such as gagne from gang, bécosse (toilet) from back house, bobépine from bobby pin, paparmanne from peppermint, and pinotte from peanut. One can observe some Anglicisms that are not the same as those in MF. We find in QF être conservateur (to be conservative), faire le party (to party), and avoir une date avec quelqu’un (to have a date with someone), where in MF one would say être prudent, faire la fête, and avoir un rendez-vous (galant). Instead of week-end, parking, and email commonly used in MF, QF uses fin de semaine, stationnement, and courriel respectively. In asserting itself, Quebec French faces two issues: it stands between the ongoing invasion of English and the will to fight against it, and also between a desire to conform itself to Metropolitan French and to claim proudly its own particularities. 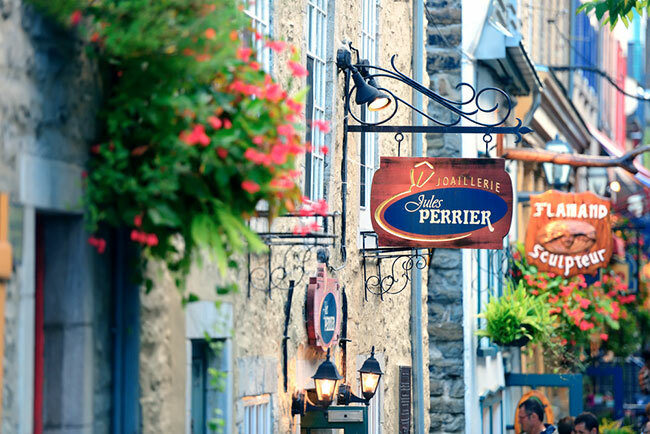 Over the years, Quebec French has moved from a very popular English-mixed dialect to a valuable distinct and recognized French language. The Quebecois like to consider it as a true language and are eager to protect it, since it guarantees the liveliness of their particular culture in an English-speaking North America. Image: Quebec City, Canada via Shutterstock.